I started loving the game after seeing the gentle swede sweeping across the wimbledon lawns in the mid 80s. 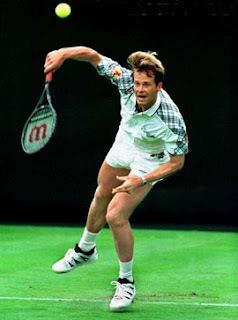 Yes I am talking about Stefan Edberg. He did not have a big serve to threaten his opponents, but he sure knew where to place his serves and there was/is no one better than him when it comes to volleying. His deep, down the line volleys have left the opponents gaping and confused. His biggest opponent was Boris Becker. I liked Boris too, cos he was the Johnty Rhodes of Tennis. His dives in the lawn have left many a girls lose their heart for him. If only he dived like that in cement courts, he would have left the scene very early. Now a days when I see a tennis match, i do not see the grace anymore. It is indeed a war these days. Serves launched at rocket speed and cross court winners that zoom at missile modes has made the game look more fast. King Fed is ofcourse ruling the roost with little opposition from Nadal and Nalbandian. But where has the grace gone?. Tennis is no more a game that enchants us. BTW Edberg has agreed to Coach Sania Mirza. Will that change the scenario? Serve and volley has been consigned to the history books. Pity. Chriz thats right. Isnt everything a WAR these days, including CRICKET!